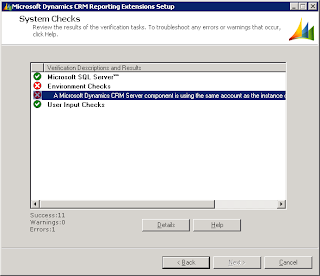 Ayman's Tech Blog: A Microsoft Dynamics CRM Server component is using the same account as the instance of SQL Server Reporting Services. 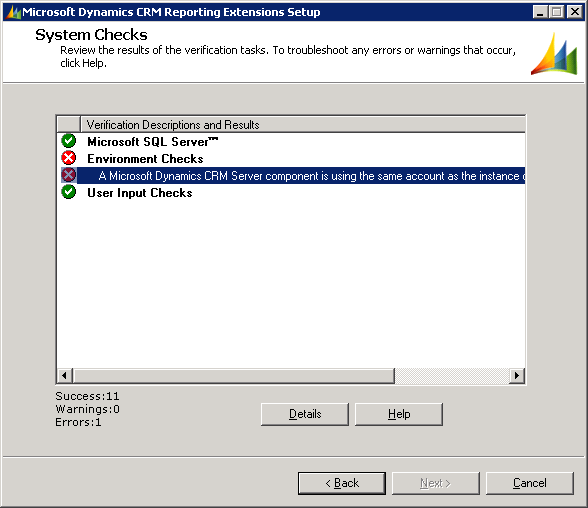 A Microsoft Dynamics CRM Server component is using the same account as the instance of SQL Server Reporting Services. I got this error while upgrading CRM 4.0 to CRM 2011. 08:55:45| Error| Check ReportingAccountMemberOfSecurityGroupValidator : Failure: A Microsoft Dynamics CRM Server component is using the same account as the instance of SQL Server Reporting Services. It was fixed by removing the Reporting Services service account from the AD security group SQLAccessGroup in the CRM OU. This fixed my Reporting Services Install error.